It was July 14 and I was driving back from my weekly drawing session when I noticed that my cell phone was dead. I had forgotten to put it in its charger the night before. Usually I’m pretty good about plugging it in each night because my husband and I keep pretty close tabs on each other. We are the kind of couple that are turely opposites in almost everything we do. He is usually off somewhere shooting trap, riding his motorcycles or flying his remote control airplanes. Of course I am usually doing something related to art or nature and the outdoors. The cell phones keep us close even when we’re apart. I wondered about my husband Art, ( yes his name is Art …so you see I do love Art, both the man and the discipline) how he was doing on his long ride in the mountains. He and his boss took their high powered racing motorcycles up to Boone NC planning on checking out the highland games and having lunch. It was a beautiful day and I was glad he could get away and have some fun. I figured he would call and check to see how my session went and upon arriving home I when stright to the phone machine. You can imagine my angst when the first message was from Art saying he had an accident. He sounded very alert and his usual self but his message was rather frightening because he said he was in a ravine and no one could find him. Literally he was calling me from the scene of the accident and he was alone, injured and lying on the side of a mountain. Right in the middle of the message and before I had time to think, the phone rings again. Its Art, he says he’s sure his shoulder is broken, maybe his collar bone too and he has called 911 for help. They are looking for him but without any real landmarks and it being a very rugged rual area, it may be a while. I can hear the blaring of his motorcycle’s horn going off in the background as he speaks. I have a sinking feeling in my chest because I can’t think of a single thing to do or a way to help him. He is three hours away. The poor guy calls me just wanting to reassure me that he is Ok and not to worry. He says he can hear a motorcycle, it’s Jim, his boss going back and forth on the road, looking for him, just 100 feet above him, but Arts says he isn’ t visable from the road and he’s sure he didn’t leave any skid marks. Most likely the sound of his motorcycle is louder than Art’s mototrcycle horn because even thought its blaring, Jim continues to ride by. We talk and I try to reassure him that help will come soon and he says he is trying to lay still and be calm. its alreadybeen about 20 minutes when 911 calls him back and tells him they have recived a call from a homeowner who can hear his horn blowing, so they know where to look and the search and rescue team will be sent there ASAP. Apparently a woman who has a home nearby was in her garden at the time and could hear a horn but couldn’t see anything from her lower vanatage point. She called her neighbor who lives on the top of the mountain which looks down into the ravine and asks him to go outside and look for a car. He of course does this and can see Art and his motocycle lying on the side of the mountain just a ways below him. These two good samaritans and the rescue team probably saved Art’s life that day. I’ll have to find them and give them all a big hug. Arts in surgery as I write this note. Its been 6 weeks 6 days since his accident. He has internal injuries and needs to have some blood removed from his chest cavity. He did have broken bones, a clavicle and scapula, shoulder blade and five ribs. He also severed his liver and puncured his lung. He was wearing full body armor and of course a high tech racing helmet or he wouldn’t have made it. He will have a long recovery and will face some difficult days ahead, but I plan to be there for him and will do everything I can to help him be 100 % again. No he will never ride a mortocycle again and it will be awhile before he can shoot trap, kyack on Lake Wylie or mountain bike but when he gets out of the trauma center, I have a recliner at home with his name on it . Maybe indoor sports will be his hobby for awhile. P.S. I’m thinking of investing in a cell phone for him with GPS. 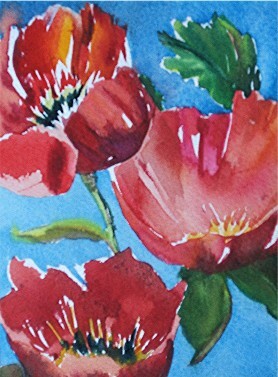 It is a very red painting and I’ve been influenced to paint this smaller piece with some of the same colors. 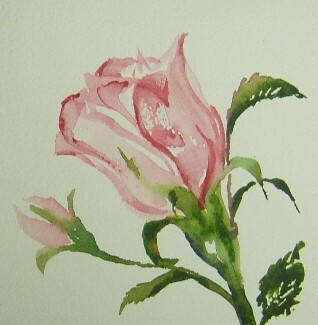 This is the companion painting I made for the other small rose bud painting I completed earlier this week. 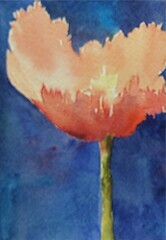 I have tried to sneak in painting whenever I can, usually when I’m waiting or if Art’s (my husband) asleep, it’s a saving grace for me and something that’s helps me get thru each day. Its the one constant. Like an old friend, my palette and brushes are there for me, I find comfort and solace in painting. I have been a little down this week and I guess its because it has been so long now…going to the hospital everyday and hoping that all will be better tomorrow. Of course tomorrow is the same thing and days have turned into weeks ( six weeks) each day seems to be no-different than the next. The long days and nights seem almost a blurr to me and I’m tired most of the time. I’m glad I have the little dailies to paint, its like a small oasis in an unfamiliar landscape. I’ve tried not to write about my husband’s accident because I’m an upbeat person most of the time who likes to be positive. To talk about each procedure, each, situation just seems to dwell on the negative. I’m sure he will be 100% one day, its just going to take time. 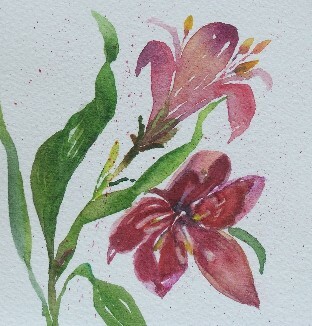 I like to paint these little paintings without drawing them first. Painting one stoke at a time and watching the paper… allowing it to give me clues as to what comes next. 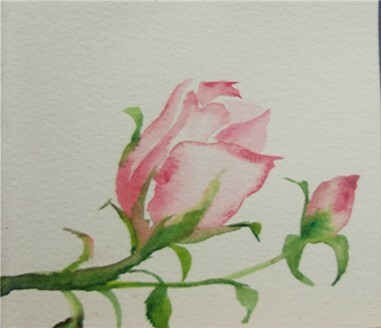 Try it, yes you will have to start over once in awhile but the freedom it gives is well worth the few thrown away , and of course you can always paint on both sides of the paper. I do! I painted this in the hospital while my husband was asleep. I made up a little travel kit so I can meet my daily obligation. Today makes six weeks since his motorcycle accident and he has been in the hospital this whole time. I have tried to keep up with my daily painting all this time…but many nights I’m exhausted and can barely pick up my brushes. My husband seems to be better each week and I have hopes our life can get back to normal soon. I love poppies and they make me turn my head and look at them even while driving thru the mountains. You see… they plant them along the sides of the roads in North Carolina so there will be thousands of them blooming all at once. Hugh plantings usually near the off ramps…looking like patch work quilts. Individually Standing tall and blowing in the wind. Its more than an artist can take in at one time. Of course in this drought we are in, I didn’t have any poppies to see today. 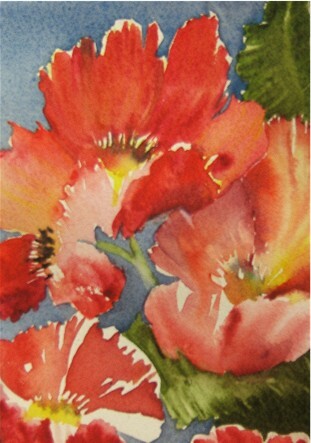 I painted these from my memories of the poppies I saw this spring along side of the road while driving up to Wild Acres. This is a haven for me and I think of this artist community often when stressed. If you have been up that way you know what I’m talking about. It’s very beautiful.